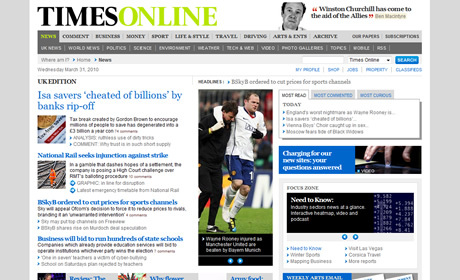 On Friday, the Times and Sunday Times announced that both websites would begin charging users for access to content from June. As expected, this has caused a bit of a stir on the likes of Twitter and it’s struck a chord with the design and development community especially. The Times is one of the first high-profile websites to implement a paywall system and although the fee is a relatively small one (£1 a day or £2 for a weeks access to both sites), this hasn’t stopped a heap of criticism coming the way of the newspaper. The move is undoubtedly one to help secure the long-term future of the company, with sales of some national newspapers down by over 50% from 200o to 2009 (the Times reported a decline of 21%) with Times Newspapers Limited losing a reported £240,000 a day alone. While it’s obvious that the website will lose a huge amount of passing traffic, or ‘window-shopping‘ according to Times editor James Harding, if only 5% of the websites current traffic converts to paid subscription, it will raise the paper over £1.8million a month. There has been no comment yet if the drop in reader numbers will affect advertising revenue. After a quite heated discussion in the office on Friday (nothing a round of tea didn’t solve, mind you), we decided to gather some opinions and make a blog post out of it. “I think The Times are bold for being the first to (properly) introduce this – but do I think it’ll be a success? Not really. There have been numerous studies on the science of “free stuff” over the years, and they’ve all shown the same thing: An absolutely huge percentage of people will take something if it’s offered to them for free. Conversely only a tiny, tiny proportion of the same people would take that same item if it was offered to them for 50p. What’s my opinion? Well, I think the majority of people who read the Times every day will feel the charge is good value considering the quality of material published. It is however obvious that users who just use the site every now and again will just use another free service such as the Guardian and the BBC, but that’s not who the Times are targeting. As we’ve already mentioned, even if 5% of their user-base sign up, the paper will make over £1.8million per month which will surely go some way to ensuring the long term future of the company. In my opinion, nobody is losing out. The people who don’t read the times often will continue to read similar content from elsewhere for free, the avid Times readers will pay £8 a month to continue reading high quality journalism from their favourite news website and the Times will hopefully make enough money to keep publishing newspapers and high quality content on their website. What’s your opinion? Are the Times being greedy or are people expecting news for free being unrealistic?